The BizLibrary Collection, curated by experts, includes high-quality, short, video-based lessons covering topics important to today's workforce. Ensure every employee has on-demand access to training on the core skills your organization needs to remain competitive. Customize your solution by adding on our specialty libraries to meet the unique needs of your workforce. In order for online training to drive business measurable results, the solution must be engaging and effective. Curated by the experts to ensure the highest-quality content on the market. Variety of formats and styles to meet the diverse learning preferences of the modern workforce. Engaging reinforcement boosters to ensure learning is retained and applied. Additional support materials to extend the learning process. Mobile-friendly employee training videos accessible anytime, anywhere, on any device. 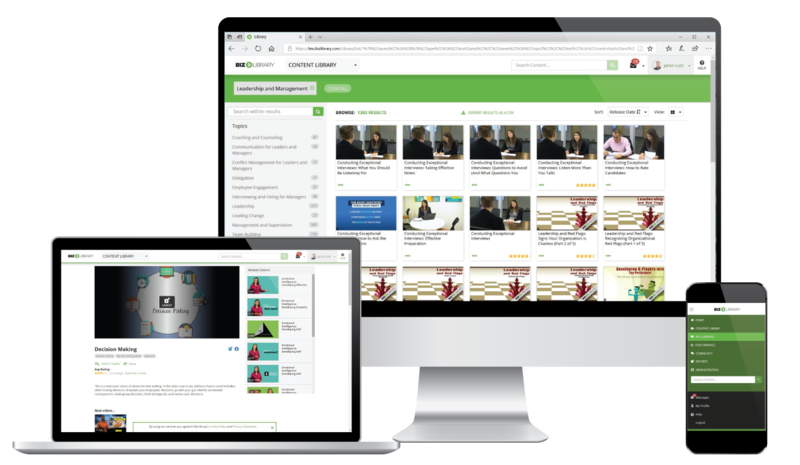 1,000+ video lessons are released each year, keeping the BizLibrary Collection fresh and up to date. Our learners elect 54% of the training they complete in a year. That’s more than 3x the rate of the industry benchmark. Learners consistently rate our video lessons and courses 4+ stars.